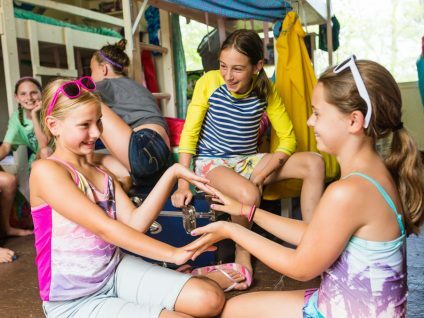 The foundation of our camp community starts with our individual cabin groups. Eight campers and two counselors live together in each cabin. They spend a majority of their day eating, playing and working together as a cabin to enjoy camp to the fullest. Each camper is encouraged to help make cabin decisions, be responsible for their belongings, learn to be independent, and support the other campers. 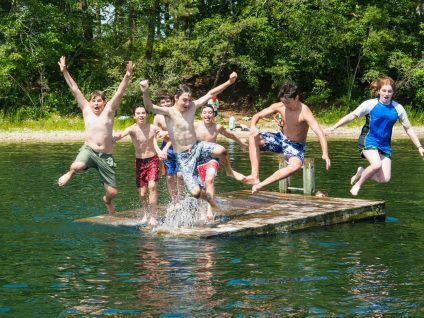 Campers build long lasting friendships with their cabin mates through spending time together at camp-wide events, meals, campfires, CAP’s (Cabin Activity Periods), beach party, and our daily flagpole ceremonies. Each cabin has an identity all its own that is displayed in many unique ways, including cabin decorations, songs and cheers, dress up days, themed meals, and campfire skits.